Economic Development groups in Michigan's Saginaw Valley must have noticed that the only bright spot in the regions economy has been renewable energy. On February 12, 2009, three of the groups, Midland Tomorrow, Bay Future Inc, and Saginaw Future Inc., have formed the Great Lakes Bay Economic Development Partnership to promote the area. The proximity of Hemlock Semiconductor, the world's largest producer of super-pure polycrystalline silicon, that is used to manufacture photoelectric solar cells, has already begun attracting solar cell manufacturers to the area. The groups plan to accelerate that growth, using, among other approaches, a website, Michigan Solar Advantage. The Michigan Department of Environmental Quality recently gave a boost to all forms of alternative energy by asking that applicants interested in building coal generation facilities consider all possible alternative first. Writing in the Detroit Free Press in January, 2009, former DEQ director Steve Chester wrote that investing in renewable energy would, by 2025, " not only dramatically reduce greenhouse gases from Michigan sources but also create 129,000 new jobs, add $25 billion to Michigan's economy and result in lower energy prices for home owners and businesses." Midland based Dow Chemical company has introduced a flexible photovoltaic solar cell packaged in the form of a roofing shingle that can be easily integrated with standard asphalt shingle materials. Now the product has been named one of "The 50 Best Inventions of 2009" by TIME magazine. 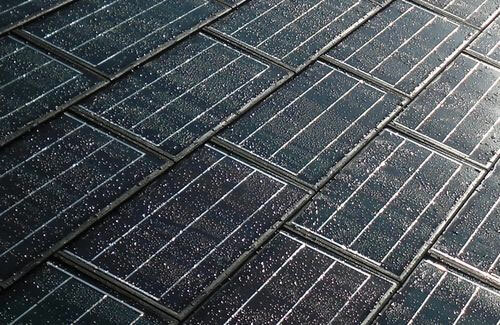 According to the magazine, "The innovative shingle is expected to cost 10% to 15% less than traditional solar panels and will be cheaper and quicker to install." The article states that Dow expects the product to produce as much as $10 billion in revenue by 2020. The product has generated quite a bit of interest in the green blogosphere, including articles on TreeHugger and Jetson Green. Treehugger noted that "Dow has a commitment to sustainable development and backs it up with management systems which promote safety, health, environment quality and energy efficiency;", and in addition, noted the thousands of potential jobs which could come to hard-hit Michigan. Jetson Green reported "the CIGS cells used by Dow "operate at higher than 10 percent efficiency, below the efficiencies for the top polysilicon cells -- but would cost 10 to 15 percent less on a per watt basis." This, in turn, should make the Solar Shingle about 30-40% cheaper than other BIPV systems." 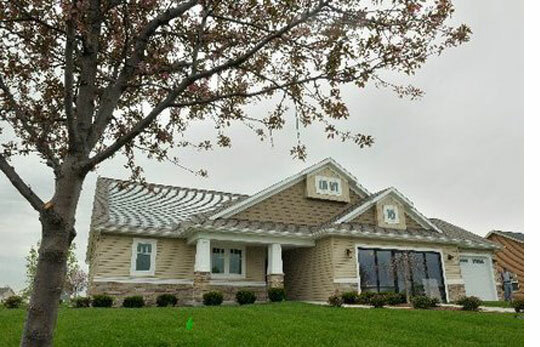 A new home in Bay City's Monitor Township uses Dow Solar shingles and a suite of other technologies to do something skeptics might not have believed could be done in cold, cloudy Michigan. Over the course of a year, the home is designed to produce more energy than it uses, resulting in negative energy bills, and almost no greenhouse emissions. The structure was built by local builder, Cobblestone Homes, in cooperation with Dow Chemical, Dow Corning, and Hemlock Semiconductor. The house, which has 3 bedrooms and 3400 square feet, is expected to sell in the 300,000 dollar range, and has an expected pay back period of 22 years on the additional energy upgrades. According to the Bay City Times, Dow expects 50,000 houses to install Dow's Powerhouse shingles in the next 5 years. Take a virtual home tour here. The Detroit Free Press reported in June 2009  that newly proposed incentives could bring Renewable Manufacturers to the state in a rehabilitated Ford assembly plant at Wixom, MI. According to the Free Press, "Investment in the proposed project would initially be $725 million to create 4,300 direct jobs, growing eventually to about $1 billion altogether. The two firms would use about half of the 4.7 million square feet of buildings on the 320-acre site, and recruit other firms to join them." Under the proposal, Ford would sell the facility to Xtreme Power of Austin, Texas, a grid storage battery maker, and Clairvoyant Energy, a solar panel maker, of Santa Barbara, Calif. Associated Press reported  that the facility had "the potential to create another 10,000 supplier-related jobs -- 1,500 at or near the plant." The Saginaw Valley is home to Hemlock Semiconductor, a joint venture of Dow Chemical and Dow Corning, the world's largest manufacturer of the polycrystalline silicone compounds necessary for solar electric panels. An expansion announced in May 2009 in Hemlock has made the area a magnet for new solar manufacturing firms. One such enterprise is Evergreen Solar, which will be locating in Midland, and bringing 15 to 25 jobs, and a $30 to 50 million investment. Some advocates of coal energy take the position that new coal plants are needed in order to supply the energy the nascent solar industry needs to expand. "Evergeen Solar is an integrated manufacturer of wafers, cells and panels. Their unique string ribbon technology for making wafers has created quite a stir in the industry. This exclusive video interview with CEO, Richard Feldt, describes this string ribbon processes. The process is continuous, silent and clean: long wires unwind from spools, run through the molten silicon and pull a long "ribbon" of silicon out of the melt. The ribbon is harvested periodically and cut into smaller pieces for further processing into solar cells." - from The Evergreen YouTube site. Environmentalists have noted that the Evergreen facility will release "about 4.5 pounds of mercury to be released from the Evergreen plant per year. Mercury, a toxic substance known to impair brain function in humans, isn't usually associated with manufacturing facilities." HSC split its new investment, committing to new expansion at the Thomas Township facility, beginning immediately, and to build a new, $1.2 billion manufacturing facility in Clarksville, Tennessee. The two states have competed vigorously for the investment, and HSC promises that up to $800 million in further investment will be made in coming years, divided between the two locations. The developments at Hemlock Semi has sparked enthusiastic speculation of a coming "solar boom" in the Saginaw Valley. In late 2008, economic development groups in the Saginaw Valley communities of Midland, Bay City,  and Saginaw, formed a "Solar Alliance" to research the potential for further growth in the area. In February of 2009, those groups launched a marketing campaign, with a companion website MISolarAdvantage.com to bring new solar manufacturing and fabrication industry to the area. Many other regions around the world are competing for business in this sector. According to the Bay City Times, "The group is called the Great Lakes Bay Economic Development Partnership, after a regional "brand" developed by a Midland marketing company. Hollister said the three organizations have signed a memorandum of understanding to jointly market the region and recruit new solar investment. The slogan is "Locate at the Source," a reference to Hemlock Semiconductor in Saginaw County, which makes a third of the world's polycrystalline silicon, a key component in solar panels and electronic devices." Michigan's two largest utilities, Consumer Energy, and DTE, are moving in the direction of solar photovoltaics, even though Michigan is not known as a sunny state. "Europeans are so far ahead of us in terms of renewables. There's a lot of photovoltaics installed in Germany, and Germany doesn't have very sunny weather, too," said Kurt Westermann, renewable energy business director for Black & Veatch Corp. in Ann Arbor. A pilot program to demonstrate a "Feed In Tariff" approach is under development by Consumer Energy, which would pay premium rates for photovoltaic power. The program is limited to 2 megawatts, compared to about 900 megawatts of planned wind installation. The Michigan Business Review reported that "The rates would be fixed for 12 years and would vary from 65 cents per kilowatt-hour for residential customers who install solar panels by the end of 2009 to 45 cents per kWh for non-residential systems. By comparison, Consumers charges customers about 10 cents per kWh for electricity." "A new state industry is emerging, one powered by the sun rather than an internal-combustion engine." "In the Great Lakes Bay Region, Dow Corning and Hemlock (Semiconductor) employ more than 1,400 scientists, technicians and others in the solar energy field. About 1,000 construction workers are on site as it expands. The company is investing a total of about $2.5 billion at the factory. ", Kart reported. Thomas Township, in Saginaw County, will be the location for a manufacturing facility for Georgia based Suniva Corporation. Aided by a photovoltaic Michigan Business Tax credit of $15 million, the plant will create 500 new manufacturing jobs, when fully operational. According to the Saginaw News, the plant represents a $250 million investment. The News wrote, "Other planned or already OK’d incentives include: A Michigan Economic Growth Authority tax credit of up to $8.6 million; more than $45 million in property tax savings as part of a 15-year Renaissance Zone; a potential $10 million Community Development Block Grant to prepare the site for construction; and a Saginaw County Community Development Block Grant loan of $500,000." According to the Midland Daily News, "Suniva Inc. was founded by Dr. Ajeet Rohatgi through his work at the Georgia Institute of Technology’s University Center of Excellence in Photovoltaics, which was started in 1992. The company manufactures and markets high-efficiency, low-cost photovoltaic cells and markets high power-density modules in its current 100 megawatt facility in Georgia." Saginaw business leaders also have expressed hope that a California based solar manufacturer will be locating a $177 million solar manufacturing facility on the city's northeast side. The plan would involve revamping the defunct Enterprise Automotive Systems as a solar module manufacturing facility. According to the Saginaw News, "If GlobalWatt chooses the Saginaw site — an unnamed Texas community is Saginaw’s competitor for the plant — the jobs would arrive at about 100 workers per year from 2010 to 2015," according to a GlobalWatt’s spokeswoman. The Detroit Free Press reports that the largest solar site in Michigan, an array capable of powering 20 to 25 homes, is about to open. According to the Free Press, the project was inspired by Consumer Energy's experimental Feed In tariff program, which will buy renewable energy from independent providers at favorable rates. The project in Galesburg, MI, will be the first large one online under the program. • Leslie Science Center, Ann Arbor: 5 kilowatts of solar panels on the roof of the Nature Center. • Oakland University, Rochester Hills: 10kw roof solar system on a student apartment complex. • University of Detroit Mercy, Detroit: 10kw solar system on the roof of the engineering school building. • Barclay Dream Farm, Webster Township, Washtenaw County: 3.2kw ground system of solar panels that move with the sun. • David D. Hunting YMCA, Grand Rapids: 18kw of solar panels on the roof. • Cityside Middle School, Zeeland: 1kw solar panels on the roof. • Michigan State University, East Lansing: 10kw roof system at the MSU Pavilion, an events center. • Jarecki Center at Aquinas College, Grand Rapids: 10kw system on its metal roof. The Pew Charitable Trusts recently released a report on Green jobs across America, which they say is "the first-ever hard count across all 50 states of the actual jobs, companies and venture capital investments that supply the growing market demand for environmentally friendly products and services." and found that, "between 1998 and 2007, jobs in Michigan's clean energy economy grew 10.7 percent while overall jobs declined 3.6 percent." Hemlock Semiconductor officials hailed the report, saying, "Dow Corning and Hemlock Semiconductor are excited about the future potential of solar technology as a clean and renewable energy source and are making significant investments to support this rapidly growing industry." Reporting on the study, the Detroit Free Press noted that "Michigan has the 10th largest number of clean energy jobs in the nation". According to the Detroit Free Press, the study noted that "the sector accounted for 22,674 jobs at 1,932 businesses in 2007, Pew researchers found. Though these numbers are still relatively small, jobs in Michigan’s clean energy sector grew by 10.7% between 1998 and 2007, compared with a 3.6% decline for all industries in the state. Among the states, Michigan also had the third highest number of clean technology patents from 1999 to 2008. “Michigan is a leader in today’s clean energy economy,” said Kil Huhcq-kyung, the report’s lead researcher." The report further noted that "Michigan faces stiff competition from other states as it seeks to become a leader in advanced vehicle batteries, wind turbine parts manufacturing and other clean tech areas. Ohio, for example, ranked fourth in the total number of clean energy jobs, with 35,267 positions at 2,513 businesses. It also attracted $74.2 million in venture capital to its clean energy industry from 2006 to 2008, compared with $55.1 million for Michigan." Stanley "Skip" Pruss, the new director of the Michigan Department of Energy, Labor & Economic Growth,  spoke in Bay City on March 5, 2009. According to Pruss, the Saginaw Bay area has the potential to become a renewable energy powerhouse. Pruss told a group of 100 that, by building on investments already made by Hemlock Semiconductor, Dow Corning, and Dow Chemical, as well as the burgeoning Saginaw Valley wind industry, the region an re-invent itself. On June 16, 2009, Evergreen Solar announced that hiring was underway for its Midland manufacturing plant. The Midland Daily News reported that the initial round will hire two production supervisors and four chemical process technologists for the first phase of production. The small staff being hired at this point will eventually grow to 100 to 125 employees. 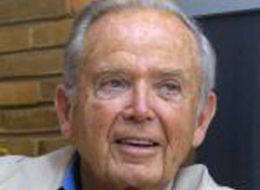 Former Michigan Governor William Milliken wrote in the June14 Detroit Free Press, that Michigan could become the nation's "Clean Energy Powerhouse". "...we must reject fear and turn with hope toward a clean energy future. Renewable energy has the potential to create even more jobs and more wealth than the Internet did. The Midwest, and Michigan in particular, could see huge benefits from clean energy industries. To accelerate these benefits, Congress must swiftly act to put a cap on carbon pollution." "Congress is debating the American Clean Energy and Security Act of 2009, which includes a carbon cap. Opponents of the bill have been pandering to fear, attacking it for being too expensive. Some have thrown around unsupported claims that a carbon cap will cost consumers thousands of dollars a year. Actually, an analysis by the Environmental Protection Agency found that a carbon cap will cost as little as $98 per year per household, or roughly 12 cents per person per day. "In exchange for that small investment, Michigan will get more jobs, cleaner air and less dependence on imported oil -- not to mention the chance to once again be the vital center of the world economy." Greenville Michigan is home to one of the most successful solar manufacturing facilities in the country. It is a success story of entrepreneurial determination, government action, and citizen activism. Michigan Governor Jennifer Granholm advocates a "Feed-in Tariff" to help jump start solar and other renewables in Michigan. for a presentation by Ovonic's Chairman, Subhendu Guha, Ph.D.
Michigan's nearest international neighbor, Ontario, Canada, has become a global leader in renewable energy, with forward leaning policies that have drawn massive investment and opportunities to the province. In January, 2009, Ontario announced a 7 billion dollar international partner ship with Korea's Samsung corporation, that will include thousands of new megawatts in renewable generating capacity. The program will include wind turbines that will generate up to 2,000 megawatts, as well as solar power facilities that will generate up to 500 megawatts, according to Reuters News agency. The program will also create 16,000 direct and indirect jobs, including 4000 permanent jobs, mostly in new manufacturing. ↑ Jeff Kart, "Groups Partner to turn solar companies on to Midland, Saginaw, Bay counties", Bay City Times, February 12, 2009. 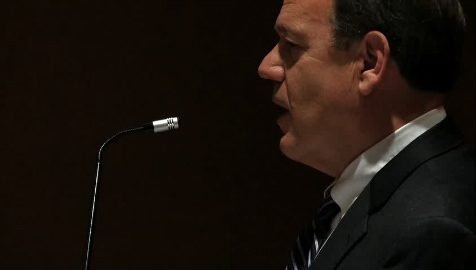 ↑ John Flesher, "State to Utiliies: Seek Coal Plant Alternatives", Associated Press, February 26, 2009. ↑ Smarter energy can benefit state's bottom line, too"Steve Chester, Detroit Free Press, january 24, 2009"
↑ Dow Steps out into the sun with Powerhouse solar shingles"John Laumer, Treehugger, October 7, 2009"
↑ The Solar Shingle"Time Magazine, November 23, 2009"
↑ Solar Shingles see the light of Day"Phil McKenna, Technology Review, January 20, 2010"
↑ Dow Unveils Impressive New Powerhouse Shingle"Preston Koerner, Jetson Green, October 6, 2009"
↑ The Future is here today with Net Zero home in Bay county"Michael Wayland, Bay City Times, May 21, 2010"
↑ 9.0 9.1 Tom Walsh, "Wixom deal would be big win for state", Detroit Free Press, August 26, 2009"
↑ Officials: Energy Companies Want Closed Ford Plant"The Associated Press, August 26, 2009"
↑ "Hemlock Semiconductor expansion 'one of the biggest investments in the history of Dow Corning'," Bay City Times, March 2, 2008. ↑ "New Midland solar plant to bring 15 to 25 jobs, $30 million-plus investment," Bay City Times, May 29, 2008. ↑ "Will Midland become solar hub?," Midland Daily News, May 30, 2008. ↑ 14.0 14.1 Jeff Kart, "Making solar panels requires old-fashioned coal-fired power" Saginaw News, June 7, 2009. ↑ "Hemlock Plans Up To $1B Michigan Investment" WNEM-TV/AP, December, 15 2008. ↑ "Hemlock Semiconductor splits investment; $1B for Thomas Township, $1.2B in Tennessee" "The Saginaw News," December 15, 2008. ↑ "On verge of solar boom?" "The Midland Daily News" December 16, 2008. ↑ "Dow Corning growth good for Bay County, company officials say" "The Bay City Times," December 15, 2008. ↑ Jeff Kart,"Great Lakes Bay Region has competition when it comes to attracting solar industry", The Bay City Times, June 5, 2009. ↑ Sven Gustafson, "Utilities to Michigan: Solar energy wanted", Michigan Business Review, August 10, 2009. ↑ Jeff Kart, "Solar Power: Great Lakes Bay Region", The Saginaw News, June 4, 2009. ↑ Eric English, "Dow Corning Corp. engineer among 1,500 Great Lakes Bay Region scientists, techs and others in solar", The Saginaw News, June 5, 2009. ↑ 25.0 25.1 "Suniva to invest $250 million in solar plant in Saginaw County's Thomas Township", Midland Daily News, October 6, 2009. ↑ Barrie Barber, "New solar company could invest $250 million, create 500 jobs in Thomas Township"" Saginaw News, October 6, 2009"
↑ Leaders hope seed sprouts for $177M, 500-job solar plant in Saginaw"Justin Engel, The Saginaw News, November 26, 2009"
↑ 4 dreamers have plan to energize state"Tina Lam, Detroit Free Press, January 4, 2010"
↑ Jeff Kart, "Michigan's Hemlock Semiconductor praises green jobs report", The Bay City Times, June 10, 2009"
↑ Katherine Yung, "Michigan ranks 10th for number of clean energy jobs", Detroit Free Press, June 10, 2009. ↑ Jeff Kart, "State Official: Saginaw Bay could be renewable Energy Powerhouse", Bay City Times, March 5, 2009. ↑ "Hiring underway at Midland Solar Panel Plant", Associated Press, June 16, 2009. ↑ Cheryl Wade, "Evergreen Solar Begins Hiring", Midland Daily News, June 16, 2009. ↑ William Milliken, "Make Michigan Nation's Clean energy Powerhouse", Detroit Free Press, June 14, 2009. ↑ [http://planetark.org/wen/56449 Ontario Says Samsung Deal to make it Green Leader]"John McCrank, Reuters, January 22, 2010"
↑ Samsung Signs $6.6 Billion Deal to Build Wind and Solar Power in Ontario"John Lorinc, Green Inc. Blog, January 21, 2010"
This page was last edited on 14 February 2012, at 17:26.